For the first time ever, the player is a Pokémon, speaking and interacting with other characters in a world populated only by Pokémon! Features a deep, involving and dramatic story brings the player into a world of Pokémon not seen or experienced before. Strategic battles enhance the adventure. Randomly generated dungeons make every mission unique. One day the player awakens to find that he or she has been turned into a Pokémon. The land is being ravaged by natural disasters so the player decides to form a rescue team with a partner Pokémon. 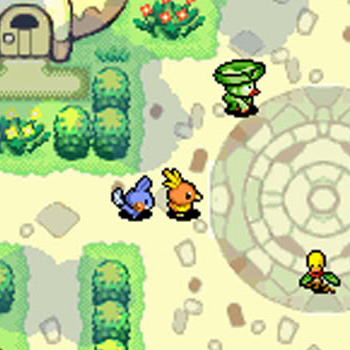 The player can interact with many different Pokémon on various missions while trying to uncover their true purpose and destiny. An engrossing story of adventure, redemption and, most of all, friendship.